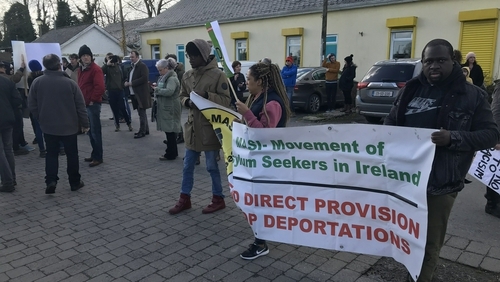 Fewer than 30 people have turned up at a public protest in the town of Rooskey on the Roscommon-Leitrim border, to express their opposition to Government plans to provide accommodation for asylum seekers in small hotels there and around the country. Meanwhile, before the event began, a local resident asked the protesters to leave the town. The woman, who did not give her name, said that nobody in the local area was in any way in favour of racism, but the local people resented groups from outside the area coming in and "giving the town a bad name". The meeting was addressed by MEP Luke 'Ming' Flanagan, who outlined his opposition to the housing of asylum seekers in hotels. There were a number of confrontations between different factions of protesters, with verbal exchanges still continuing.